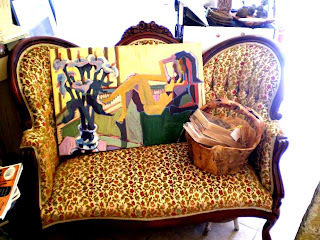 MIGNONNE: New Vintage Furniture and Décor Items at Mignonne! New Vintage Furniture and Décor Items at Mignonne! 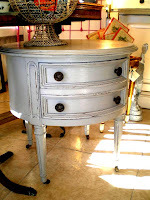 For example, this smart side table with drawer, repainted in a soft grey has lots of great touches including carved legs, original hardware and wheels on the legs. 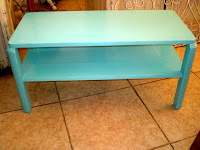 Or how about this great aqua coffee table with art deco lines? An unexpected, eclectic combination of a bright, fresh color on classic lines. 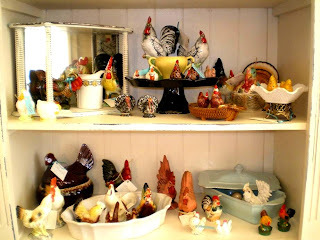 We also have a big batch of highly collectible, painted porcelain roosters and chickens ... they'll definitely bring a French touch to your kitchen. We've got decorative pairs, salts and peppers ... large and small. Each set is one of a kind. This very sweet antique settee, just right for an afternoon of canoodling, is rare to find in such perfect condition. Carved, 3-tier back along with detailed carved arms and legs make it a standout. These are just a sampling of the unique items you have come to expect from Mignonne. We consistently seek out affordable, lovingly restored furniture and décor as well as modern design items that guarantee to bring comfort and beauty to your home. See you soon!